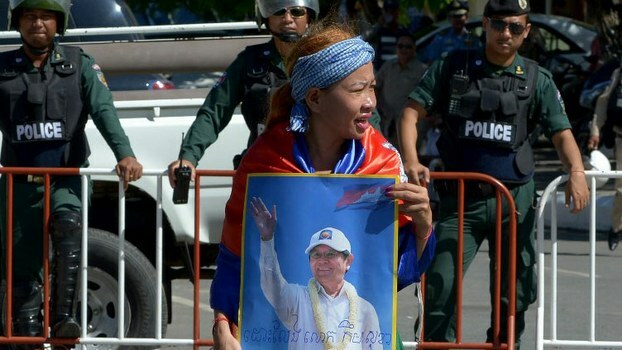 A Cambodia National Rescue Party (CNRP) supporter holds a placard with a portrait of CNRP leader Kem Sokha as police block a street during a protest outside the court of appeal in Phnom Penh, Sept. 26, 2017. AFP. Four of eight lawyers working for jailed Cambodia National Rescue Party (CNRP) President Kem Sokha abruptly resigned on Tuesday, telling RFA’s Khmer Service the decision was made at the opposition leader’s request, while vowing to support his party’s quest to restore democracy in the authoritarian Southeast Asian nation.